COMMUNICATIONS MINISTER PAT Rabbitte has said he does not believe some of the practices of British media that have been exposed by the Leveson inquiry into media ethics are present in Ireland. 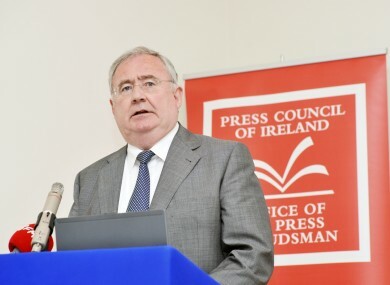 He was speaking at the launch of the Press Council of Ireland and Office of the Press Ombudsman’s annual report for 2011 in which both the Press Council and the Ombudsman said that they would be considering the recommendations of Leveson. The wide-ranging statutory inquiry is currently examining the relationship between politicians and the media in Britain in the wake of the phone hacking scandal. Today it heard evidence from former British Prime Minister Tony Blair. Rabbitte said at the launch of the report that the inquiry raised questions about the relationship between politicians and the media which were worthy of debate but said it was his belief that much of what has been uncovered is not present in Irish media. “It’s a dangerous statement but I don’t believe that some of the more odious practices exposed at the Leveson inquiry are present in Ireland,” he said. The annual report published today follows a similar trend to recent years with complaints in relation to truth and accuracy the most frequently cited, accounting for a third (33 per cent) of all complaints made. This was followed followed by prejudice (23.5 per cent ), privacy (10.8 per cent) and distinguishing fact and comment (10.2 per cent). The increase in complaints under prejudice was accounted for by a large number of complaints about two articles which generated 64 complaints. In total, the Press Ombudsman, Professor John Horgan, decided on a total of 42 complaints last year and upheld 40 per cent of them. In 24 per cent of cases sufficient remedial action was deemed to have been offered or taken by the publication. Almost a quarter of cases processed were either resolved informally or successfully conciliated between the parties concerned. “It goes without saying, therefore, that these findings and recommendations will be of interest to, and will be discussed by, the Press Council as soon as they are published,” he added. O Ceallaigh also said that the chairman of the Press Complaints Commission in the UK, Lord Hunt, had recently been in Dublin to hold talks with him and Horgan “at which matters of mutual interest and concern were discussed”. He pointed out that the Irish model of press regulation had been cited in a positive manner during the course of Leveson’s public hearings. Meanwhile, Horgan said that his office would be launching a new public awareness campaign in order to ensure that the visibility of his office is enhanced. Horgan said this would include increasing awareness generally, ensuring the public and those working in the media were more familiar with the Ombudsman’s decisions, working more closely with those in the industry and exploring the potential use of social media. He said the message that the campaign would be delivering would be that professional standards of journalism in Ireland are being maintained. “This message is that, in an age of media fragmentation, the blogosphere, and web-based threats to the traditional economic model of newspapers and magazines, member publications of the Press Council uniquely proclaim, and agree to observe, professional standards of journalism which are not applicable elsewhere in the print media,” he said. Email “'Odious practices' exposed by Leveson not present in Ireland - Rabbitte ”. Feedback on “'Odious practices' exposed by Leveson not present in Ireland - Rabbitte ”.